A doctor is summoned to the Winchester estate to assess the mental capacities of Mrs. Winchester, whose odd behavior and construction habits on her home have led the board of directors of her company to question her sanity and ability to run the business. The Winchester mystery house is an oddity of construction that is massive in size and is built with little rhyme or reason. This location and its history have all of the ingredients for an interesting ghost story...that is if it can be handled correctly by competent filmmakers. This haunted house is the subject of the latest horror film from the Spierig brothers, who have directed films like "Predestination," "Daybreakers," and most recently, the awful "Jigsaw." 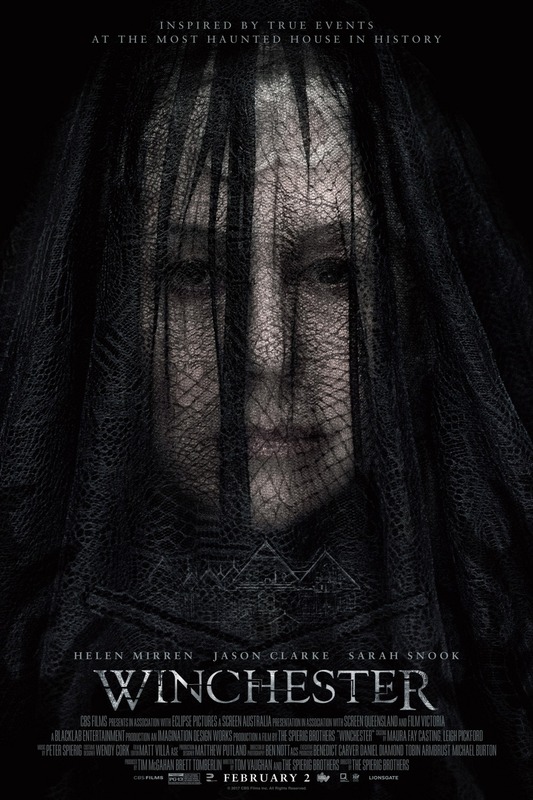 It stars Helen Mirren as Sarah Winchester, who is responsible for constructing the now famous Winchester mansion as a way to atone for the guilt she feels about the people killed by the Winchester rifle. Room by room, the house is constructed in meticulous detail to house each dead person's spirit. Joining Mirren is Jason Clarke as Dr. Eric Price, a psychologist who is hired by the board of the Winchester Repeating Arms Company to assess Mrs. Winchester's mental stability. Price is asked to stay at the Winchester home for a few days to give his evaluation, but while he is there, he starts to notice strange and unexplainable occurrences. The Winchester mansion is said to be one of the most haunted houses in America. Given the built-in curious, odd nature of the building and its fabled history, one might think "Winchester" would be an immediate success. That is not the case. What we get is a generic, cliche-riddled ghost story that lacks any originality or intrigue. The Spierig brothers fail to set any creepy mood and they don't build any tension. Instead, they rely on the typical and expected jump scares we've come to loathe about the horror genre. Sometimes these scares come from ghostly figures, but most of the time, absolutely nothing pops out and goes "boo" other than a loud eardrum-bursting noise. Most of these jump scares fail to get a response from us because we can see them coming from a mile away. While we did react to one or two of these noises, it's not because they were effectively frightful, but because they hurt our ears instead of genuinely scaring us. Helen Mirren is one of our favorite actresses. She's upper echelon Hollywood elite, so why the hell she would agree to take a part in this project is beyond us. Luckily, she doesn't treat the screenplay like she's above it as an actress, but that doesn't mean she's giving a worthy performance. On the Mirren Meter™, she's giving it about a 3.5 out of 10 for effort. Sarah Winchester is a character constantly shrouded in a black dress and veil, one of the most stereotypical horror movie offerings imaginable. On the subject of "expected," every aspect of this story is commonplace, right down to the small child singing a soft eerie melody to let the audience know that a ghost is just around the corner. Speaking of letting the audience know things, the vast majority of the dialogue in this script is comprised of exposition. Every interview Dr. Price has with Mrs. Winchester is all about exposition. These talks set the stage and give the audience all the information we need to know. So many of Dr. Price's conversations are little more than expository dialogue. It makes us scared for the future of writer Tom Vaughan and Spierig brothers because it's clear they are not clever enough to make even the ghastliest of premises work to their advantage. On top of all this, the constant exposition drags the pacing down to a crawl and makes this film a dreadfully boring sight to see. Add all of this onto an ending that is absurdly and mind-numbingly stupid that we just about lost whatever little respect we had for it up until that point. It's next level stupid. Sorry, Helen Mirren. Pretty costumes and a cool setting aren't enough to save "Winchester" from being a tensionless slog.